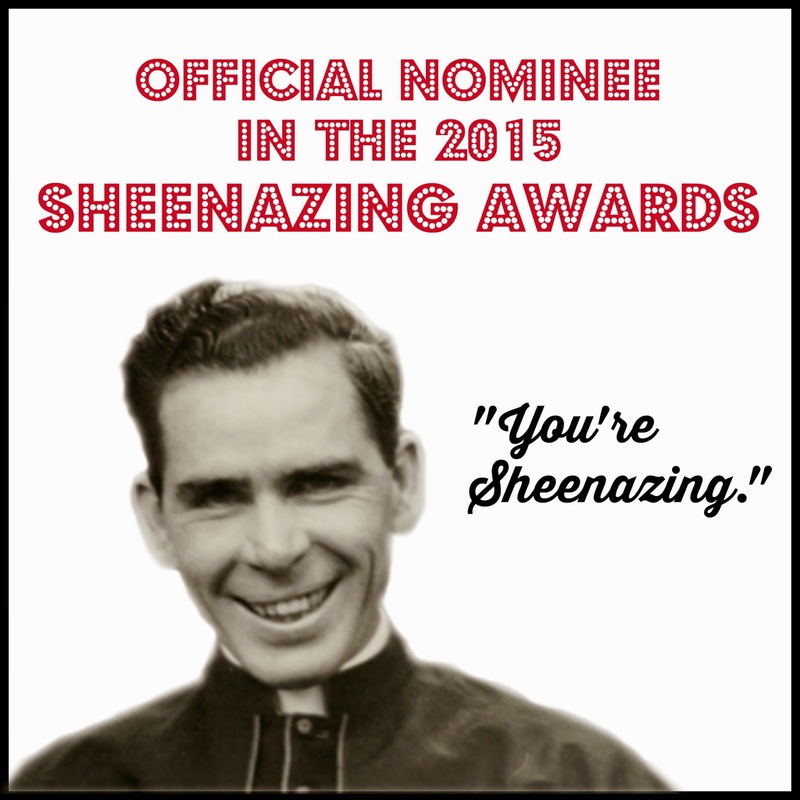 Voting is now CLOSED for the 2015 Sheenazing Awards! One vote per reader, please! Except it will say "Winner"
You can vote now or read through the nominations first. 1 - Nominations were only taken for blogs written by Catholics who are faithful to the teachings of the Catholic Church and believe that Pope Francis is the true pope. Bloggers currently enrolled in RCIA are also eligible. The "Best Blog by a Non Papist" category is exempt from this rule. The SAABM and I did our best to make sure that nominated blogs were orthodox. If we missed something please email me. 2 - Nominations that did not include URL and name may not have made it to the final ballot. We do our best. 3 - If a blogger has won in a category in the previous two years they cannot win again this year in that same category and therefore will not be on the ballot for those categories. 4 - A blog must receive at least three (3) nominations in order to make it to the final ballot. Blogs with fewer than three nominations will be included in an Honorable Mentions list. 5 - This is for fun, so have fun! 6 - *Several websites with multiple contributors were nominated for various categories. After speaking with the Sheenazing Awards Advisory Board Members it was decided to create a new category for such sites. To qualify for this category a site must have various bloggers writing content and those contributors are not related and/or best friends. So Like Mother, Like Daughter, which is written by a mother and her daughters, would still qualify for the blog categories but Epic Pew, which is written by various people who might not actually know one another only qualified for the Best Blog with Multiple Contributors. And in the end, this isn't a science - it's just a stay at home mom doing her best while her kids nap and watch Netflix. I am in awe of you! Thanks for this fun event!! What a fantastic list! Congrats to all these great nominees! Thank you for all the work you put into these blogger awards! So many great blogs listed! I'm honored to be listed with so many great nominees! God bless! "It's the most wonderful time of the year!" Thanks, Bonnie! Seriously! I love the Sheenazings! You're the best, Bonnie! Thank you so much for your hard work! I look forward to this every year!! Oh man oh man. I feel so honored! I'm going to go bribe all my friends to vote for me! Thank you for all of the hard work! Just the nomination made my year. I love getting to click over to some new reads! Hi Bonnie! According to the official rules, if a blog is nominated less than 3 times it is included in honorable mention. Is this right or wrong? No I didn't nominate myself-ha! What a great list of blogs to check out! Thanks for sharing all these nominations - I look forward to seeing who the big winners will be! Cue the Sally Field gif! You like me! You really like me! Yay! Another wonderful job well done to the most encouraging blogger around - Bonnie! This is always such a fun event. Thanks so much, Bonnie! Oh, my goodness - I'm absolutely bowled over that I've been included with these wonderful nominees! Much thanks! I am 100% completely shocked. Baffled. Falling out of my chair. Wondering if I entered an alternate reality? Coming in and out of consciousness?..... from finding my blog nominated! NOMINATED?!! Wow. I can't believe there are 3 or more people out there to nominate me! How exciting! I feel so honored to be included. Thank you for putting this together, Bonnie! Thanks for all you do, Bonnie! I don't mean to sound stupid, but if you are going to mention Real Housekeeping on the list, it would be fair to include a link to it. It is a mag but it also is a website and/ or blog with an actual url, right? Thanks for including it/ us. So first my jaw dropped, then I did a double take, then I shouted "WHAT!!!!!!!" as I was scrolling through the list and saw that my blog was nominated. In case anyone was wondering such a reaction is in fact not conducive to nursing a baby to sleep. Thank you, Bonnie, for all the hard work you do organizing this! I am really looking forward to discovering lots of great new blogs to read! I did notice that my blog Halfkindled.com was listed twice in the Best Under-Appreciated blog, and just wanted to let you know. Thanks so much for nominating me. It's enough just to be nominated. Hugs & blessings... and congrats to ALL the nominees! I am UBER excited to be nominated. I feel like I already won "something" having my blog listed next to all of these awesome Catholic blogs. I'd like to know why I don't see YOU on this list, Bonnie? Let's just make a new category all for you - Rock Star Blogger. Mwah! Humbled and honored to be listed with such fine peers. Hats off to you Bonnie for organizing this. What a smorgasbord of blogs! Thanks for all your hard work, Bonnie! ...it is fun looking at some new blogs- thanks for this! Where is Camp Patton on all these lists?? I'm flatly stunned and genuinely delighted to have been nominated! It brings me joy to know I'm not actually just shouting into the void. Congratulations to all the nominees, appreciated and under! Thanks so much for this, Bonnie! It's so exciting! Thank you Bonnie! Count in the number of humbled bloggers on this list. Congratulations all around! Some people on the Internet like me, hooray! Thanks for all the hard work you put into this, Bonnie! I was giddy to have been nominated, and so happy to see so many of my favorites on here too. (Including the honorable mentions!) So fun! Thanks for organizing this. I love Sheenazing season. Thank you so much for doing this, Bonnie. Loving this "awards season". Just from the visibility of being "honorably mentioned", I have met SO many wonderful bloggers this week. So much to read!! Thank you for making that possible. Really enjoying this week because of it. Hope you are enjoying yourself too!